"You may be on to something important here." your report of such an increase in Tc is amazing." 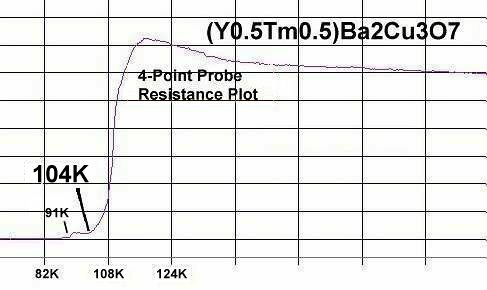 Superconductors.ORG herein reports up to a 15 degree improvement in the critical transition temperature (Tc) of YBCO (YBa2Cu3O7) through the substitution of a heavy rare earth element into every other Yttrium site. Since the discovery of YBCO in 1987, researchers have attempted to tweak the Tc of this compound upward by doping the Yttrium site with various elements. Divalent cations (Mg, Ca, Sr, Ba) and monovalent cations (Na, K, Rb, Cs) have been tried, along with all of the rare earth elements. But, only slight improvements have been reported - apparantly because the site was only "doped". 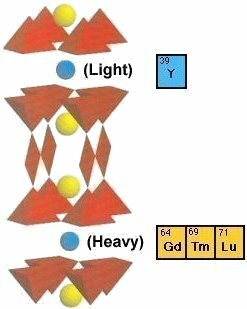 An exact 50-50 mix of Yttrium and a heavy rare earth has been found by Superconductors.ORG to significantly improve Tc. This creates substantial planar weight disparity in alternating layers, which has previously been found to increase Tc in copper-oxide superconductors. Some rare earths - like Ce and Tb - prefer a tetravalent site. Others like Yb require more Cu, which alters the 1212C structure. Additionally, the tetragonal 1-2-3 structures are usually semiconducting. So, constraints are put on what combinations can be attempted. 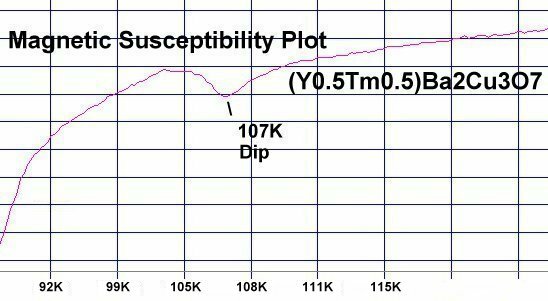 Among the heavy rare earths that are compatible and produce an orthorhombic lattice, an exact 50-50 mix of Yttrium and Lutetium produced the best results - a Tc of 106K (see below). Lutetium is the heaviest of the rare earths. Seemingly, the greater the weight ratio of Re-to-Y, the greater the improvement. 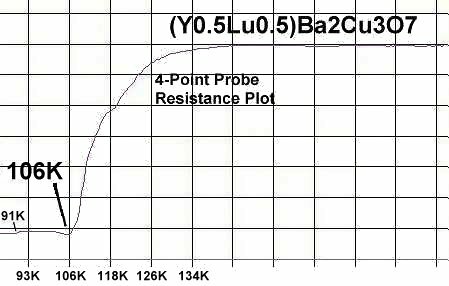 In the above plot a 15K Tc improvement is seen with a mix of Lutetium and Yttrium. In the below plot of (lighter) Thulium and Yttrium, the improvement is only 13 degrees - but the transition is sharper. A small amount of (normal) YBCO that formed as a minority phase can be seen near 91K in both plots. Gadolinium in combination with Yttrium also increased Tc, but only by about 4 degrees. The reason the (Y,HRe)-123 formulation was not identified as a superconductor before now, may lie in the fact that it has an unusual magnetization curve. A "normal" superconductor displays a sharp drop in magnetic susceptibility a few degrees above the resistive Tc. In this material there is only a "dip" at this point (see above plot). This behavior is similar to the superconductive ruthenium-oxocuprates, where diamagnetism appears at a much lower temperature than the resistive Tc. Since prior research(1) has found Tm-123 to have a high upper critical field, (Y,Tm)-123 may have the greatest market potential with its Tc of 104K. RESEARCH NOTE: Thulium copper-oxides have been found to be strongly hygroscopic and degrade rapidly when exposed to air. As such, all tests should be performed immediately after annealing. Synthesis of the material was by the solid state reaction method. Stoichiometric amounts of the below precursors were mixed, pelletized and sintered for 11 hours at 890C. The pellet was then annealed for 10 hours at 500C in flowing O2. (1) J. J. Neumeier, et al., "Thulium barium copper oxide: A 90-K superconductor with a potential 1-MG upper critical field," Applied Physics Letters, pp.371-373, vol. 51, no. 5, August 3, 1987.